This stunning LEGO (R) Star Wars (TM) book is the perfect introduction to the LEGO Star Wars universe for young fans. Children new to LEGO Star Wars will love discovering more about the galaxy far, far away in this early years reference book with cool fold-out pages. Large pictures and short, simple sentences bring LEGO Star Wars to life for children aged 5 and above. Favourite LEGO Star Wars characters are explored from Anakin Skywalker and Yoda, to Rey and Kylo Ren, while awesome LEGO Star Wars sets are brought to life. The Amazing Book of LEGO Star Wars also comes with a large pullout poster of the LEGO Millennium Falcon. 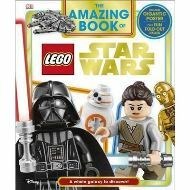 This stunning LEGO (R) Star Wars (TM) book is the perfect introduction to the LEGO Star Wars universe for young fans. Children new to LEGO Star Wars will love discovering more about the galaxy far, far away in this early years reference book with cool fold-out pages. Large pictures and short, simple sentences bring LEGO Star Wars to life for children aged 5 and above. Favourite LEGO Star Wars characters are explored from Anakin Skywalker and Yoda, to Rey and Kylo Ren, while awesome LEGO Star Wars sets are brought to life. The Amazing Book of LEGO Star Wars also comes with a large pullout poster of the LEGO Millennium Falcon.